Italian Caponata goes with everything! My new favorite dish is Italian Caponata. It’s a stew from Sicily where tomatoes and eggplants abound, so it’s a perfect autumn dish when you’re searching for yet another tomato recipe. I’m headed to the Farmer’s market today to get more Italian eggplant for yet another bowl of this luscious creation. 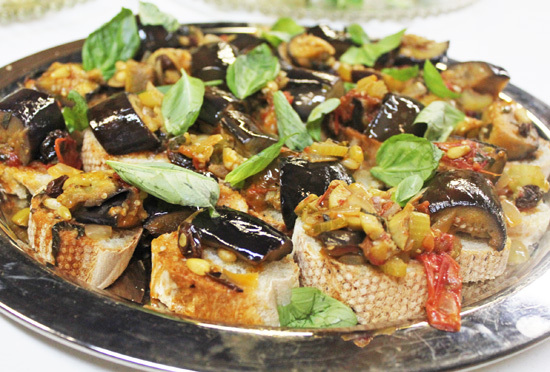 Caponata served on French baguette slices at our La Cucina Italiana cooking class. This classic dish makes the ultimate Mediterranean contorno or antipasto according the headnotes in La Cucina Italiana magazine. It’s a staple of cucina povera, but can be glammed up with seafood, which I intend to do next. Caponata served on toast with feta cheese. I’ve made it four times since finding the recipe in La Cucina Italiana’s July 2013 issue. The first time I served it over penne pasta. The second was served over a cheesy polenta. The third time we made it in our La Cucina Italiana cooking class and put it on top of my easy French baguette slices. The fourth time, I topped the baguette slices with feta cheese, then the Caponata and baked it in the toaster oven for 5 or 6 minutes to melt the cheese. This weekend I am going to make it again and serve it over fish filets. Just had another idea – in omelettes. The list seems endless! 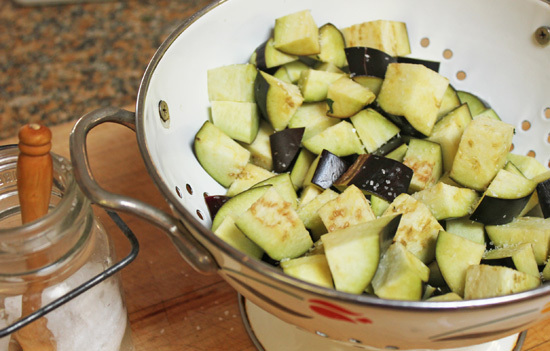 Salt the eggplant, let sit for 30 minutes, rinse and then fry the eggplant in olive oil. After cooking vegetables individually, combine them and stir. Your caponata is ready to top your favorite dish – pasta, polenta, toast, fish! the sweetness from the raisins and the nutty flavor of the pine nuts. Italian Caponata is easy to make, but has a few steps which take time, so plan ahead. Pretty soon you will be putting it on everything! 1. Put eggplant in a colander set over a large bowl; sprinkle with 2 tsp. salt, tossing to evenly cover eggplant. Let stand 30 minutes. 2. Meanwhile, in a large Dutch oven or heavy pot with lid, heat 3 tablespoons oil over medium-high heat. Add onion, reduce heat to medium and cook, stirring occasionally, until onion softens, about 5 minutes. Add tomatoes, basil and 1/4 teaspoon salt. 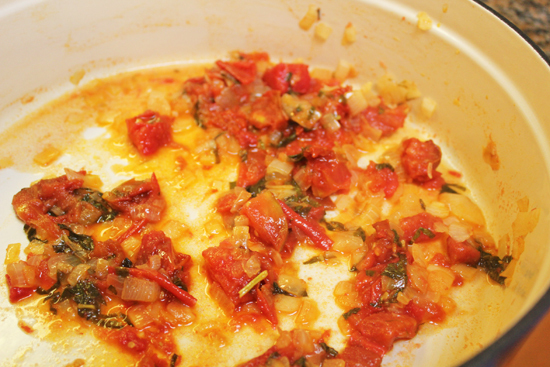 Reduce heat to medium-low; cook, covered until mixture is tender and aromatic, about 20 minutes. Remove from heat. 3. Rinse eggplant in colander under cold running water, then squeeze dry in small handfuls. 4. In a large skillet, heat 3/4 cup oil over medium-high heat until hot but not smoking, then fry eggplant in 2 batches, turning occasionally with tongs, until tender and browned on all sides, 8 to 20 minutes per batch. Using a slotted spoon, transfer as cooked to paper towels to drain. 5. Transfer tomato mixture and juices to a bowl. Add 2 tablespoons oil to pot and heat over medium-high heat. Add olives, celery and capers; cook, stirring occasionally, 2 minutes. Add tomato mixture and eggplant; cook 1 minute more. Add nuts, raisins, vinegar and sugar; cook, stirring occasionally, 3 minutes more. Remove from heat; let cool completely. Serve caponata at room temperature, garnished with basil leaves, and with lightly toasted bread. You can also serve caponata mixed into pasta or over polenta. Entry filed under: Appetizer, Cooking Class, Italian, La Cucina Italiana, Pasta, Vegetable, Vegetarian, WordPress. Tags: bread, celery, cooking class, eggplant, fish, la cucina italiana, olive, pasta, tomato. Pizza Party Cooking Class – October 9, 2013	How to make French Baguette Dough in one minute!